BUFFALO, N.Y. -- University at Buffalo women's basketball senior guard Cierra Dillard continues to garner preseason praise as she was named to the Wade Trophy Watch List, as announced by the Women's Basketball Coaches Association (WBCA) on Tuesday morning. Dillard is one of 35 players to earn a spot on the prestigious list that is presented to the best player in college women's basketball each season. The Wade Trophy — now in its 42nd year — is the oldest and most prestigious national player of the year award in college women's basketball. It is named in honor of the late, legendary Delta State University head coach Lily Margaret Wade, who won three consecutive national championships with the Lady Statesmen. First awarded in 1978 by the American Alliance for Health, Physical Education, Recreation and Dance (AAHPERD), now known as SHAPE America, the Wade Trophy has been presented to the WBCA NCAA Division I National Player of the Year since 2001. The Rochester, NY native previously earned a spot on the Naismith Trophy watch list and is enjoying a great start to her final collegeiate season for the Bulls. The senior do-it-all guard currently ranks sixth in the NCAA in scoring as she is averaging a career-best 26.7 points/game for the 2-1 Bulls. Dillard has been on top ofher game so far this season as she is also averaging 37.3 minutes, 4.7 rebounds, 4.0 assists and 2.3 steals while connecting on 45.1% of her shots from the floor and 79.4% of her shots from the charity stripe. She has gone over the 20+ point plateau in all three games this season for the Bulls and in seven straight games dating back to last season. Dillard put on a show against #3 Oregon on Sunday night as she went off for a season-high 32 points, five assists and four rebounds in the loss to the Ducks. 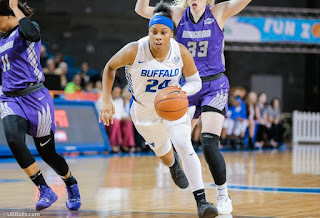 At the end of last season, Dillard put on a show during the NCAA Tournament run for the Bulls as she averaged 29.0 points, 5.3 rebounds, 4.3 assists and 3.3 steals while leading Buffalo to their first-ever Sweet 16 appearance. Over her last seven games dating back to last season, the senior team captain is averaging a team-high 27.6 points, 5.0 assists, 4.6 rebounds and 3.0 steals. The "Wade Watch" list of candidates for the Wade Trophy is composed of players selected by the WBCA NCAA Division I Coaches' All-America Selection Committee. The committee will review the list in January to determine if additional players will be added based on their play during the first half of the 2018-19 season. Dillard and the Bulls return to action on Friday, November 23 as they open up the South Point Thanksgiving Shootout against the Georgetown Hoyas at 8:00 pm. UB will then close out the tournament on Saturday, November 24 against South Dakota State at 8:00 pm.